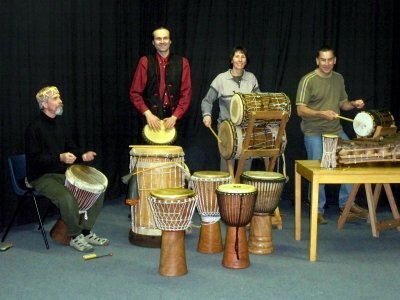 African drum classes - Drumming Is Fun! I offer one-to-one and group tuition in music (general, notation and theory) and especially West African Drumming, notably djembe, dun duns, percussion and song. I have a number of spare drums you can borrow at my classes. See our F.A.Q. Both of my weekly djembe classes for adults/teens run in parallel so you can attend either, and usually cost £35 monthly or £12 weekly (add £1/week drum hire), but do check for changes in case of cancelled sessions or extra weeks in a month. My Hertfordshire class meet on Thursdays at Saint Albans Sub Aqua Club. My Bedford class used to meet on Tuesday evenings at The Clophill Centre, near Hitchin and Luton, but are now seeking a new venue. If you live further west in Buckinghamshire, or can't make those days, check out Justine Hart's Vitae Drum Circle in High Wycombe and Wendover, which I often attend on Wednesdays. If you're in Birmingham, check out Nigel Sadler's classes. For many years I previously led another drumming circle in Hertfordshire called Secret Bass (seen here), and also taught evening classes at the University of Hertfordshire. I was a guest teacher from 2012-2015 at a community group in Milton Keynes. In 2013 I taught classes for children aged 7-11 at Southcott Village Community Centre near Leighton Buzzard, and at St. Albans before my adult grouo there. These classes have ended but might restart if there's enough demand. In November 2013 I ran another After School Club for KS2-age children at a school in Bedford. I may also travel to Dunstable, Luton, Northampton or further afield if demand is high enough. If you'd like me to hold a drumming group in your area, either for a regular class or a one-off event (perhaps a fun birthday or Christmas party? ), then please contact me to discuss your needs.